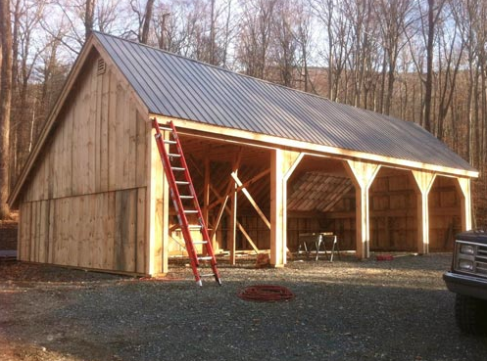 Barn kits are a great way to add storage space as well as character to your log home site. 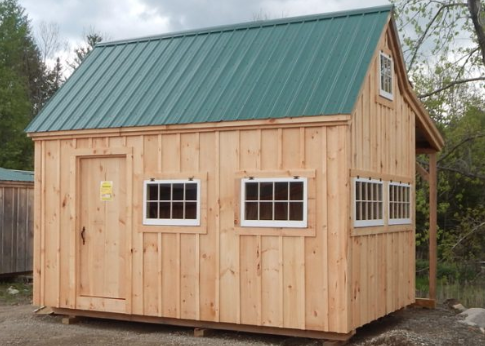 From traditional timber frame kits to gambrel roof barn designs to saltbox sheds, I discovered these outbuilding kits that are perfect for garages, workshops, artist studios and garden storage. Many outbuilding kits are just bland sheds that don't fit with the rustic elegance of a log home, but these designs include king post truss barns with steep roof pitches and rock-solid construction details that ensure these barns will stand the test of time and the harsh demands of nature. Looking for the perfect complement to your log cabin but don't want to duplicate the rustic cabin look? 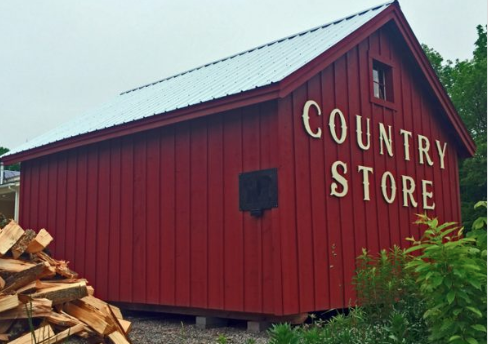 I believe these post and beam barn designs will give you all the room and versatility you need while still maintaining the country look for your homestead. You can keep a wide-open interior for large storage using a king post truss barn design, or add cozy storage and country character the grand kids will never forget with a full loft or half loft. 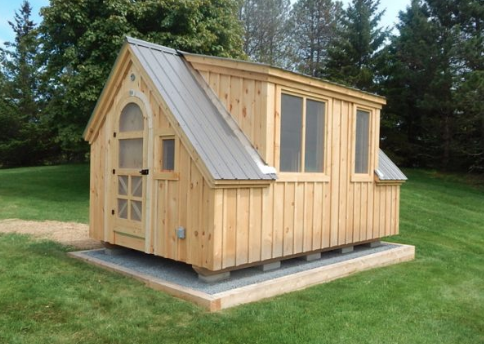 You can keep it simple or upgrade to ship lap siding with hardwood flooring in the loft and cupolas. 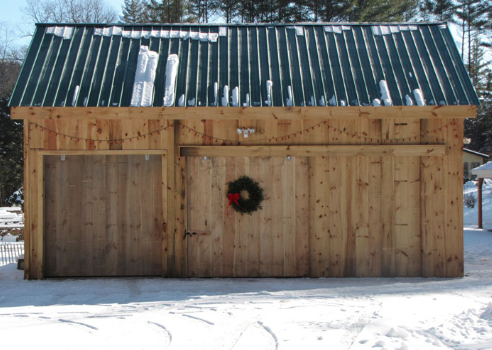 Include double sliding doors for easy access to your barn or add a lean-to on the side for even more storage possibilities. You can choose your ceiling height to go as high as 14' for even the tallest projects or large equipment. Using a kit you avoid the hassles of designing and engineering the structure. You don't need to make up your own lumber list and purchase all the individual elements. There are several choices for small barn kits. You can choose between a cute Smithaven design with a large side dormer, or a more straightforward 10'x16' Hobby House barn kit. For a more traditional barn kit you can choose a prefab barn design, like this 16'x20' barn kit with barn doors and windows ready to install. 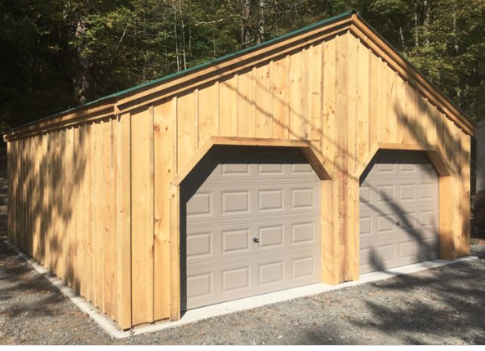 Another option is this 24'x24' simple garage. It comes with wide bay doors for easy access and a large open plan interior for maximum space. 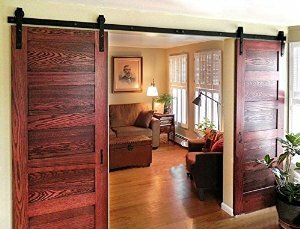 You could also consider building your own barn doors using sliding barn door hardware, customizing the wooden doors to your project. These interior barn doors add character and interest to your home. The kits come with all the hardware you need to build your own sliding barn doors. Whatever you choose, barn kits can be used for storage space, tool protection or a wood shop for your log home.